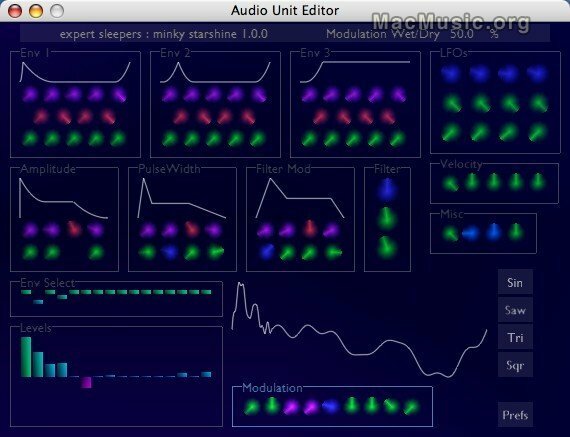 Expert sleepers announced an update to version 1.0.2 in both Audio Units and VST for Minky Starshine, in order to fix several bugs. Minky Starshine is at heart an additive synthesiser, augmented with possibilities for subtractive synthesis (i.e. filtering) and pulse width modulation. A waveform is created by summing 16 independently controllable 'partials'. By setting the relative levels of the partials appropriately you can create familiar waveforms such as sawtooth and squarewave, but you can also create an infinite range of timbres in between.